In 2013, Andrew Spackman brought to the club a set of 266 slides, which had been given to him by Isobel Smith’s daughter. The slides had been taken in Banbury some years ago by various members of the club. Andrew asked if anyone would take a look at them and report back to the committee. I was happy to do this because another of my hobbies is the study of the history of Banbury. numerous slides of the same subject. (incomplete), which I rewrote. Because of the title “The History of Banbury” this set contains several explanatory slides, which are photographs of illustrations from history books. In order to include the better slides from Isobel’s set I decided to make a slightly different show with the title “A walk round Banbury” so that the audience could see the best 150 slides from the 416 which make up the collection. There were, however, numerous problems; most of the slides are old and dirty, some appear to be sticking to their glass mounts, they are not all of the same make of film, some are under or over exposed, some I can’t identify at all etc. The solution was to scan them and enhance them as far as possible using Photoshop. About 160 were given this treatment and the remainder left for later, none have been discarded because, although they are not good enough or inappropriate to put in this show, they could well be of interest to historians and it may be possible in future to enhance them with better equipment and software than I have at present. After a few experiments I was able to make a Power-Point presentation on CD and DVD suitable for showing with a digital projector. I thought that the show should last about an hour, depending on the number of questions and comments from the audience, but when I showed it at the club for the first time on the 12th. of November , it lasted the whole evening. It seems that 150 images is about the right number. So far so good, but I was disappointed that the collection as it stands does not include photographs of some important buildings or their features. 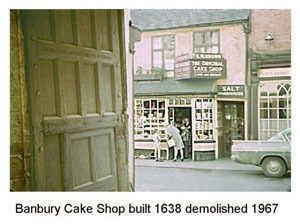 For example, I felt that in a show called “The History of Banbury”, there should have been a picture of Brown’s Cake Shop in Parsons St. “Someone in the club might have one” I thought. This was when I had the idea for an “Images of Banbury” project. 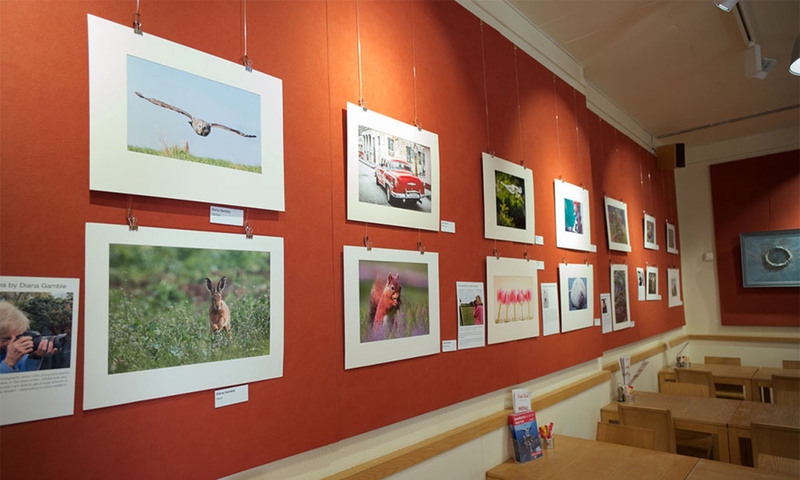 The idea is to make a collection of all kinds of images of Banbury which would be a useful photographic archive in its own right and from which shows could be compiled on a variety of themes. main stipulation being that it should be the member’s own property and s/he should own the copyright. Anyone wishing to use one of these images for commercial purposes would have to get in touch with the owner, under no circumstances would the club allow any infringement of the owner’s copyright.. 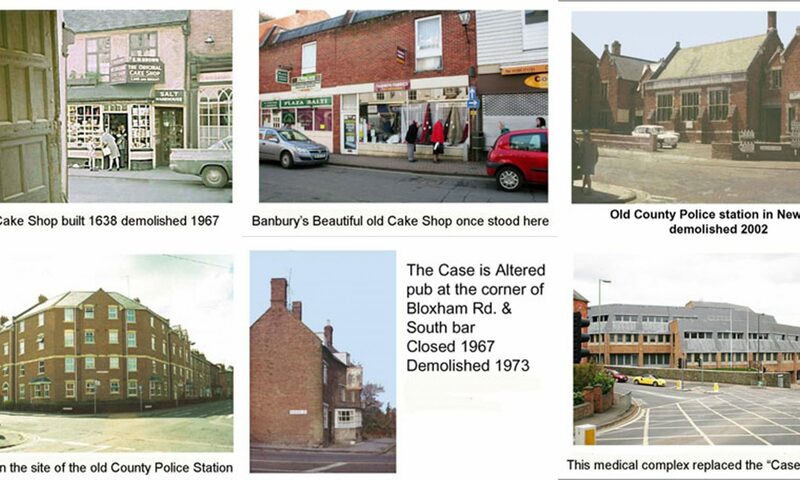 I have my own collection of photographs of Banbury and I am willing to lend some of them for this project including a slide of Brown’s Cake Shop mentioned above. The whole collection would be kept on DVD, CD and/or portable hard drive. At least two members of the club should look after the collection and each would have a complete set of discs etc. Preferably, whoever agreed to do this job would also be prepared to show the slides to other groups. As for the 416 slides we have in the collection at present, it is not possible to return most of them to their owners, which means that we will have to store nearly all of them somehow. I told Banbury Museum that the slides are in two boxes each about the size of a laptop computer and asked if they would look after them for us. The short answer was NO. Ray Jordan has been in touch with the National Media Museum who have given him details about storing slides etc. Basically one should keep the slides dry, and cool and avoid temperature fluctuations. Suitable boxes etc. are available and don’t cost much. I have made an A3 chart explaining the use of the record sheet and produced a list of the reference books I used together with their ISBN numbers. All the record sheets have been put into an Adobe Acrobat document; with which I can search through all the typed words in the records and get a listing almost instantaneously. If I type in the word “Cross” it will find and list 26 images of Banbury Cross. Thus we have an archive of scanned images, together with any relevant information, from which we can select sets of pictures to make up various different shows, each of which could be compiled with emphasis on some particular topic. If this were done sensitively I think that we can make up a few entertaining shows depending on the number of good images at our disposal. A show doesn’t have to last the whole evening, a short show can be used in one of the new “Evenings of two halves” Each show could be intended to appeal to a specific audience, the pensioners in the “Times Gone By” group would probably spend a long time reminiscing when they saw the 40 -year old slides. Such slides might not, however, appeal to a younger age group. I once helped to make up a little fun quiz called “Look Up” using recent photos of details of the upper parts of buildings in Banbury, The game was to guess where the building is. Each member of the audience was given a numbered list on which to write down the answers, the winner was given a small prize. and already given me some images which I have scanned and some ideas which I have listed on a separate page.